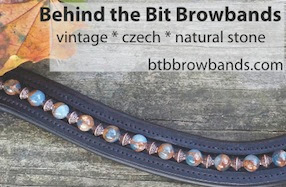 Behind the Bit: Browband love! Another awesome browband from Woven Beads Browbands on Etsy.com. The designer made the markings on the paint to "match" the paint horse I'm riding, and the colors are the owner's favorite colors. How neat is that?!? Now we need to see it ON TPO!